Sharpening your edge | Technology Focus – Folder-gluing/die-cutting | Planet Paper Box Group Inc.
Lee Alton, Northern England and Scotland area sales manager, Bobst UK and Ireland, explains the warning signs that a folder-gluer line may need upgrading or replacing. As carton designs get more complex, lead times become shorter, and brand quality requirements ever higher, box makers have come to realise the importance of investing in their folder-gluer. Poor performance or poor quality at this final stage in the carton making process can have a serious effect upon margins, markets and customer relations. ●Carton marking and scuffing: quality issues related to marking can come from the substrate itself, the finishes put onto it or from poor practices either upstream or on the gluer itself. If the material is the cause, the addition of a special feeder can significantly reduce or remove the problem. Alternatively, the belt adjusters in the transfer section may require upgrading. If none of these solve the problem, the only route is an overhaul or replacement of the machine. ●Poor folding: inaccuracies in folding the cartons, which result in fishtailing, gap and false creases, can signify a training need rather than machine fault. However, they can indicate that the gluer’s conveyors are out of alignment. A calibration and belting programme will overhaul springs and rollers. In addition, replace the belts and reset the conveyors. ●Long make-readies: when a folder-gluer is operating well, the carton comes out of the feeder, straight through the machine and is folded with minimal issues. If the belts are not tracking correctly, carriers are bent or bars damaged, operators can find themselves in battle with the machine, resulting in make-ready times increasing. Likewise, a lack of OEM supplied parts means longer make-readies. ●Slow or inconsistent running: a well cared for folder-gluer should last a lifetime but poor maintenance means the machine cannot operate at optimum speed and can lead to regular downtime. As more plants run 24/7 operations, maintenance has becoming increasingly important as has operator training. ●Losing work or increasing sub-contracting: either of these indicate poor competitiveness and a lack of production versatility. Today’s modern folder-gluers ensure fast make-readies, superb product quality and throughput, along with superior innovation, performance and reliability. ●Rising maintenance costs: while pro-active maintenance and machine modifications can reduce costs in the long-term, there comes a point where even the best maintained machine can’t deliver. Norwich-based packaging manufacturer Castle Colour has invested in its second Bobst folder-gluer, enabling it to keep pace with an increasing carton workload. Turning over circa £8m and employing over 70 staff, Castle Colour delivers carton and blister packaging products to the food, personal care and household markets. The packaging producer today runs 70% cartons and non-blister applications and 30% blister packs for the UK and EU marketplace, with a mix of four-corner crash lock packs and straight line work in its carton offering. From predominantly being a blister pack company 10 years ago Castle Colour is now picking up 200 million carton units per annum, which has completely changed the company’s production needs and requirements. Castle Colour visited Drupa 2016 to see what new machine innovations were available. The Bobst team impressed, with Castle Colour deciding on the Expertfold 80 for its next investment. Bobst says the Expertfold 80, with its integrated detection system and bar code reader, is one of the most flexible machines on the market. With its Accufeed feeding system, every box enters the machine in perfect alignment and the system is focused on cutting make-ready time and reducing waste. Delivered in January 2017, the Expertfold 80 is Castle’s second Bobst folder-gluer and sits alongside two Bobst die-cutters. The solution lets converters fold and glue up to 3,000 box styles and handles both corrugated and synthetic materials. Castle Colour says the folder-gluer has delivered more than it had anticipated in terms of running speed and efficiency savings. “We invest in what’s best for the business model and not just about the machine but everything that surrounds it – the commercial team, the training and education support, the relationship management, the innovation and the commitment to intrinsically understand our business. Bobst has delivered on that front,” says Castle Colour’s operations and technical director, Paul Densley. The company is running two-day shifts and running up to 400m per minute or 60,000 per hour on the new machine, with ease. “Today we’re seeing a 50.7% improvement in our running speed compared with our old line, and we’re not even close to the potential of the machine. In the last 12 hours we’ve run over 500,000 cartons on the line,” adds Densley. Diecut UK is launching the Evolution manual die-cutter, replacing the Goldline after six years in production. 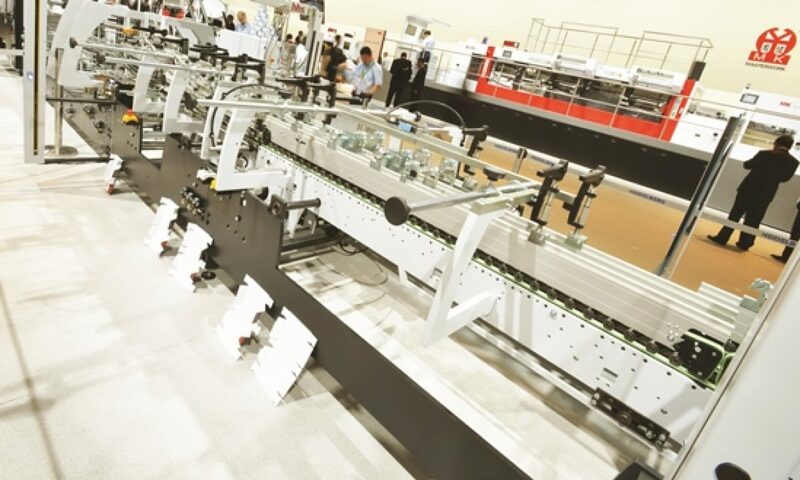 The company describes the new die-cutter as having the tonnage to cut everything from the most complex free standing display units (FSDU) to the thickest plastic, all grades of corrugated board and display board, rigid PVCs, plastics, polypropylene, leather and even kiss cutting self-adhesive vinyl. Built with safety and quick job changeovers in mind, the Evolution comes with a full laser and electronic eye safety system to prevent access to any trap points, quick and easy electronic pressure setting and a simple lock and secure system for tooling to achieve accurate registration. Masterwork and Heidelberg’s partnership has yielded a new three tier Diana range beginning with the Diana Easy 85/115, Diana Smart 55/80/115 and Diana X80/115. Featuring many common elements, the main differences are in the lengths of the individual sections and the drive arrangements. Based on the top end Diana X, the Diana Easy can produce all the major carton styles including four and six corner cartons and features inline ejection of faulty cartons when linked to a quality control system. It is pitched as an ideal universal machine for short- to mid-range packaging runs where complex folding is not required. The mid range is covered by the Diana Smart with new sizes and new configurations for 55cm and 115cm working widths. The Diana X 80/115 is pitched as “probably the most flexible machine in the market and Heidelberg’s premier machine”. Bograma’s BSR 550 BASIC rotary die-cutter makes its UK debut at IPEX at the end of this month. Supplied in the UK and Ireland by Friedheim International, the die-cutter was designed out of demand for a machine that could not only process single sheets, but also thin, folded products, such as four- or six-page folded leaflets. Mailings, advertising supplements, booklets, labels, folders, greeting cards and folded boxes are just a few examples of products that can be manufactured one-up or multiple-up by this punching unit. With corresponding flexible dies, the BSR 550 Servo can punch, kiss cut, perforate and groove, as well as de-boss. The latest development to come out of KAMA’s R&D is the FlexFold 52i folder-gluer for short runs, available from Friedheim International. The system is said to offer “record” fast job changeovers of five minutes from one straight-line box to another, as well as fast changeovers from lock bottom to straight bottom boxes thanks to features such as automatic size adjustment in both the transverse and longitudinal directions. Besides gluing and folding boxes, the FlexFold 52i offers 100% inspection, prefolding of banks, digital package printing and inline Braille embossing. Paul Thompson, product specialist for post-press packaging products at Heidelberg UK, has devised a list of questions to ask yourself and your potential supplier when buying a folder-gluer. Buying a folder-gluer is a technical process and can be complex because today there are so many options available in and around the machine. However, a common sense approach and an understanding of your market and your customers’ needs can help in the buying process. This is a sensible checklist when you approach a would-be supplier. ●What is the maximum carton size you need to handle? This determines the working width needed. ●What materials do you want to handle? For example carton, corrugated, plastics etc? ●What markets are you addressing? For instance, if you are in the pharma market where short runs are commonplace, make-ready will be more important than speed and you might want to consider a Braille unit and/or an inspection control device. If you are in the high end beverages sector you might need a longer prefolder to handle the box shape or a turning module to ensure single pass productivity. ●Do you need to handle the fairly standard carton styles (straightline, crash-lock) or perhaps 4-6 corner cartons or bespoke or speciality products? ●Present a selection of suppliers with some samples and ask them to evaluate each piece and give an estimate of the make-ready times, speed, etc for them. This will help establish a benchmark for your own production. Don’t just ask for a demonstration of a machine; take your own carton profiles and put the equipment through its paces. ●What space do you need the equipment to fit into? Do you need to compromise on machine length which may make a difference to performance? ●Ask your supplier’s advice on better preparing the blank to gain maximum productivity. Small changes that have no effect on the carton’s appearance can have a significant impact on machine performance. ●Is the machine compatible with existing equipment and existing digital workflows? Remember that JDF compatibility will also future-proof your kit if you want to sell it on later. ●What add ons do you need on the machine (such as glue application, quality control, barcode readers) and off the machine (logistics, packing, etc)? ●What maintenance is required and how easy is it? For instance, if you need to replace a belt can an operator do it or will you need an engineer? Do shafts need to be pulled to access them?